I last wrote about openSUSE in April 2013 and at the time I asked whether openSUSE was a real alternative to Ubuntu. The article sparked a number of comments by openSUSE and Ubuntu users and some people said yes, some said no. 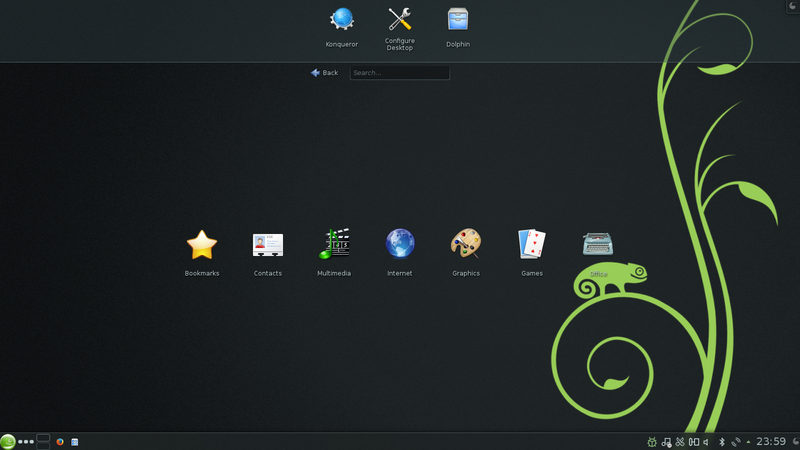 Today I will be reviewing the latest version of openSUSE to see what has changed. 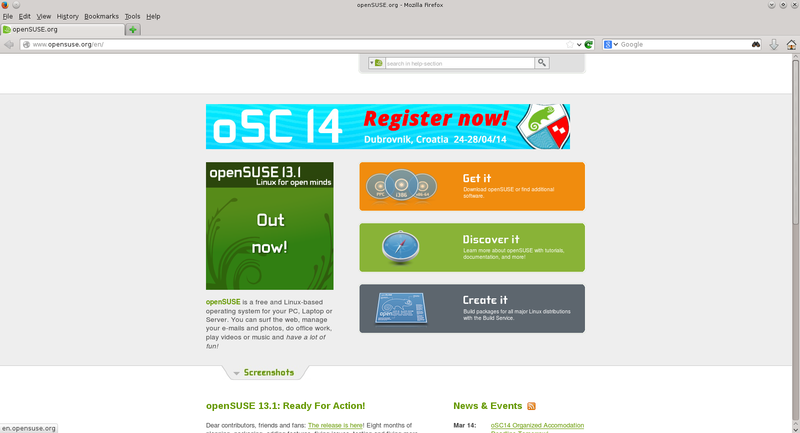 The website for openSUSE can be found at http://www.opensuse.org/en/. Click here if you would prefer to buy a copy of openSUSE due to a slow internet connection or download limits. 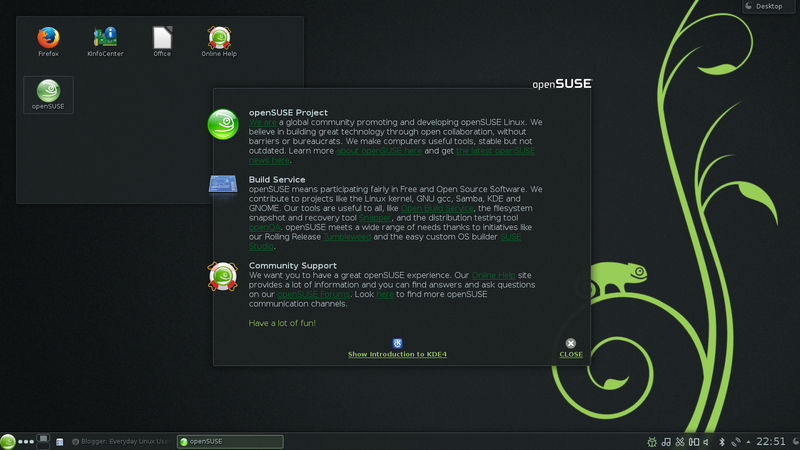 Click here for a guide showing how to install openSUSE. Note that you can’t use UNetbootin to create a bootable USB drive. You have to either use the command line or use the Image Writer tool. To be honest as I don’t use Windows I find it easier to just install using a DVD. The installation process itself is ok but the partitioning bit could be a bit more intuitive. I had a fairly basic setup with a root partition, home partition and swap partition from my previous Linux install yet the openSUSE installer said that it couldn’t find a suitable plan. I then had to create a partition plan and choose my hard drive and jump through a couple more hoops before I was able to continue. That was the only real hardship in the installation. Everything else is fairly obvious. 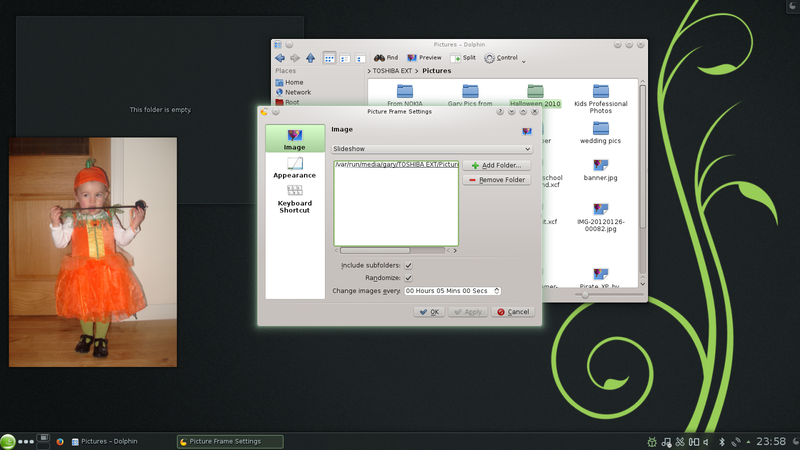 openSUSE has a fairly standard looking KDE interface with one shelf in the top left corner, a panel at the bottom with a menu in the left corner and system tray style icons in the bottom right. The icons in the system tray change depending on what you have running but the standard set include an icon for the clipboard manager, audio settings, bluetooth, network management and a clock. The menu consists of 5 tabs, menu options and a search bar. If you want to find an application quickly and if it doesn’t appear as a favourite, enter a search term in the search bar. The “Favourites” tab shows the software you use most often. To add an item to the “Favourites” tab, select it from the applications tab and right click. An option will appear with the text “add to favorites”. The “applications” tab shows a list of categories and when you click on the category a list of applications appear. The “computer” tab has options such as the Yast control center and the Yast package manager as well as the KInfoCenter, which provides information about your installation including OS version, KDE version and disk information. You can also use the “computer” tab to navigate around your system. The “Recently” used tab shows the items you have used most recently. The “Leave” tab has options for switching users, logging out and shutting down. The KDE desktop is heavily customisable and can’t possibly be covered in full here. The basic premise is as follows: Each virtual workspace is called an activity. You can switch activities by clicking on the icon with three dots next to the menu icon. The available activities will be shown and you can switch to the activity you wish to use. You can also get to this screen by selecting the desktop option in the top right corner of the screen and choosing activities. Other activities include a photos activity, a newspaper layout and search. Each shelf can have panels and widgets added. For instance you can add desktop clocks, weather widgets etc. You can change the desktop wallpaper of each activity individually by right clicking and clicking configure. There are only a couple of desktop images available by default but by clicking “Get new wallpapers” you are able to install more. Simply scroll down the list and choose the images you wish to install. To connect to the internet click on the network settings icon in the system tray. 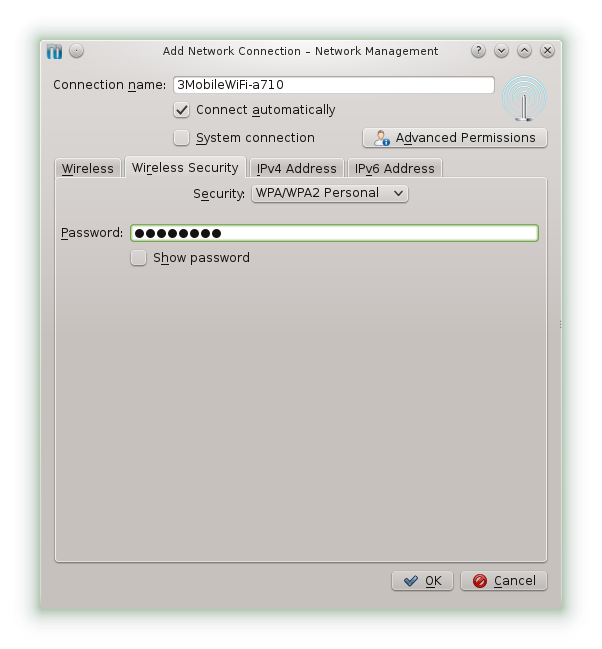 A screen similar to the one above will appear showing available networks. When you select a network for the first time you will be able to configure it by entering details such as the security key and whether you want to connect automatically. 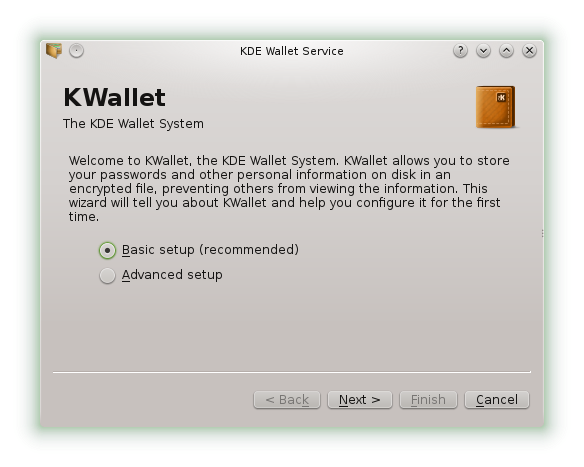 You will now be asked to setup KWallet which will store your passwords for you. Basically every time you connect to the network it will ask for your KWallet password. 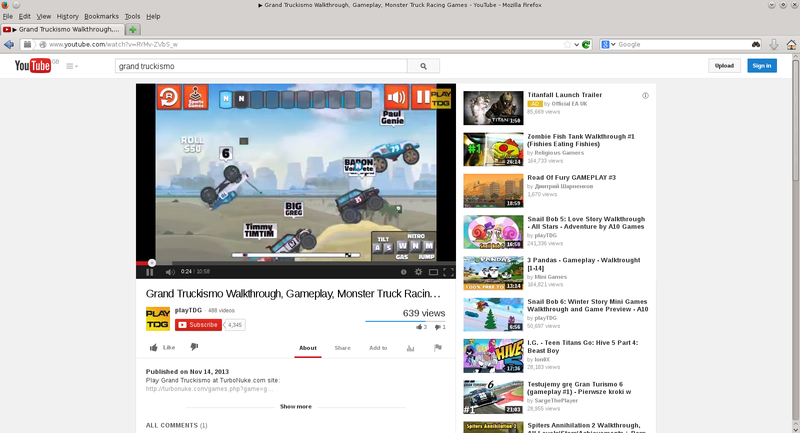 openSUSE is a community distribution and as such you have to install Flash and multimedia codecs yourself. A great resource for helping out with this sort of thing is opensuse-guide.org and specifically this page which shows how to install browser plugins for openSUSE. 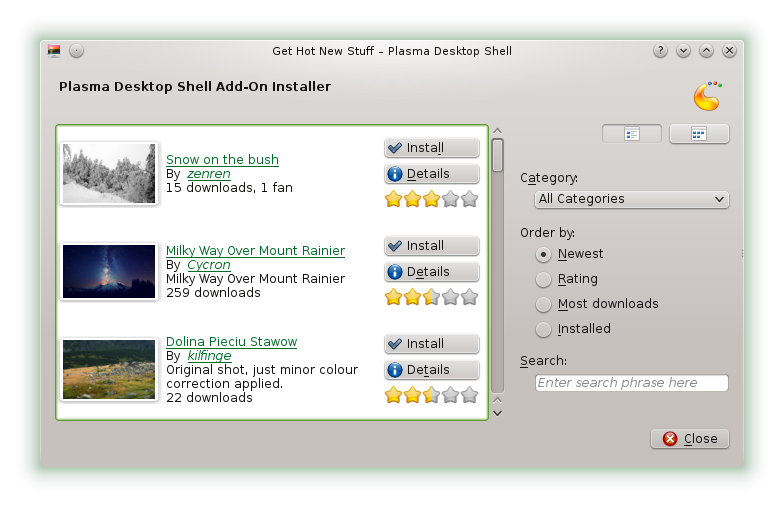 The opensuse-guide site will show you how to install Flash, Java, multimedia plugins, Silverlight and Google Voice and Chat. You will also want to check out this chapter which shows how to get MP3s working in openSUSE. If you obtain the full DVD then you will probably have more applications installed but I chose the KDE live DVD. Now you may not have heard of all the tools listed or you haven’t seen them in action. In the next week I will be getting to grips with them and give a run down of the applications to give more of an overview. To install applications you can either use Zypper which is a command line application along the lines of Apt or you can use Yast which is more along the lines of Synaptic. 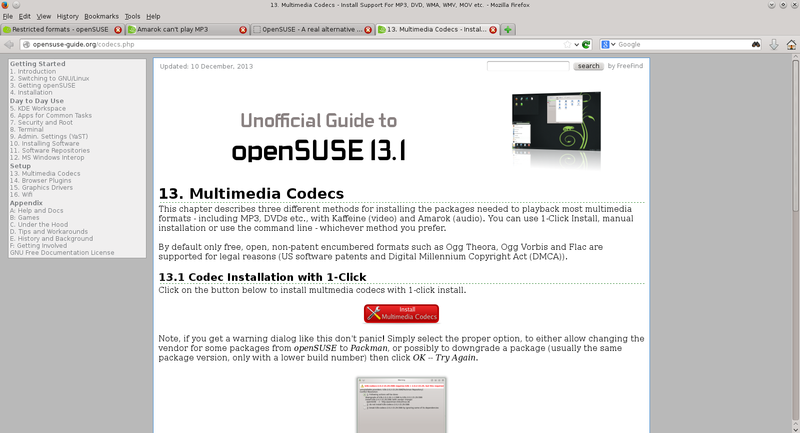 Earlier on I linked to the opensuse-guide.org site to show how to install Flash. 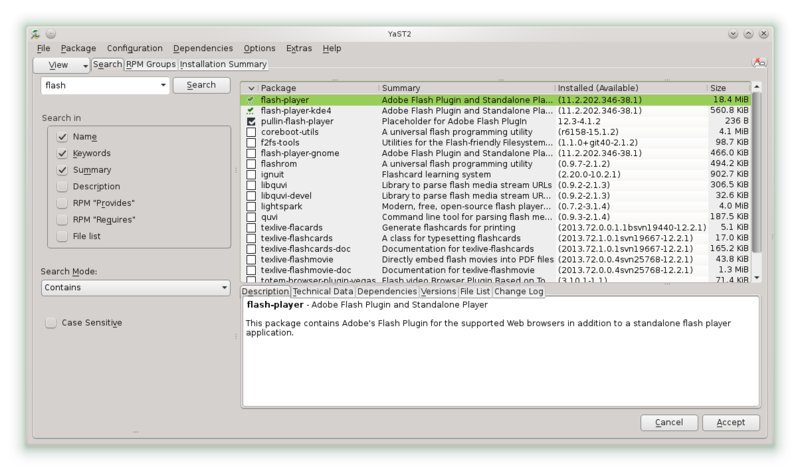 You can easily install Flash by using Yast. Yast is fairly simple to use. Enter a search term in the search box and check where to search for that term, such as the name of the application or the description. The packages will then appear in the right pane. As you can see searching for Flash will provide an option for Flash-player. To install the package check the box and click “Accept”. Now the first time you try and install something it may come as a bit of a shock when loads of other applications are listed. If you haven’t updated your system any file that needs to be updated will be listed , as well as dependencies for the program you have chosen. Now of course updating is a good idea but if you just want to install the one program you have chosen you can select “Options -> Ignore recommended packages for already installed packages”. The most helpful information I found about openSUSE 13.1 can be found at https://news.opensuse.org/2013/11/19/opensuse-13-1-ready-for-action/. 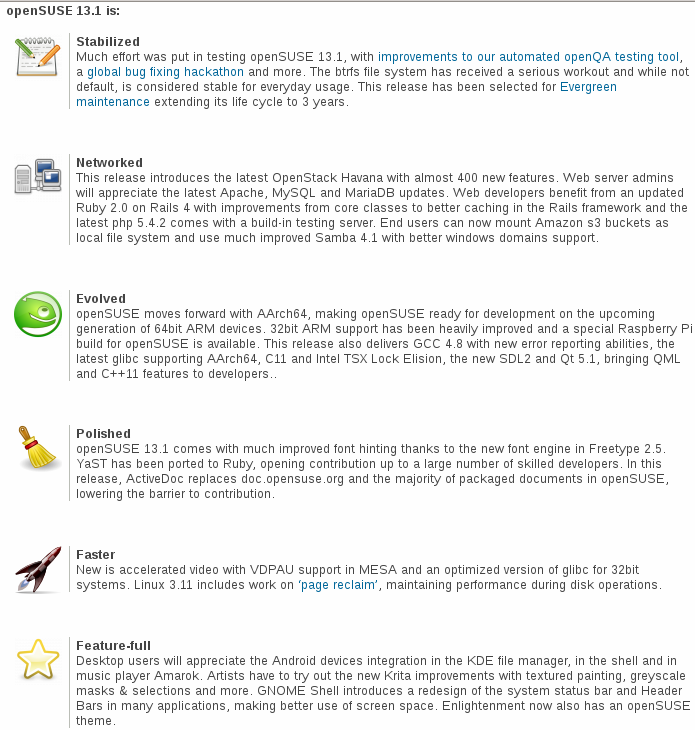 Many of the things that I mentioned in the openSUSE 12.3 review are the same in openSUSE 13.1. Now that I have got used to the way openSUSE works though I find that things that bothered me last time don’t bother me so much. For instance the fact that YAST wants to update all my packages when I try to install one package could be seen as a good thing whereas before I found it to be an annoyance. Apparently there is better support for Android devices with the file manager and Amarok. Amarok is a great audio player and I am aware I didn’t really touch on it in this article but that is for another day. Not many applications are included in the live DVD and I am surprised there is no LibreOffice Calc when all the other LibreOffice tools are installed. The Yast installer is only a menu option away so this isn’t a major issue. I think new users would definitely benefit from visiting the opensuse-guide.org website. It certainly helped me out. In my opinion the installer could do with a little bit of tweaking with regards to partitioning but I am aware that it is hard to make this sort of thing easier to use without dumbing it down and losing crucial functionality. KDE has come on leaps and bounds over the past couple of years and I would now rather use KDE than Gnome. 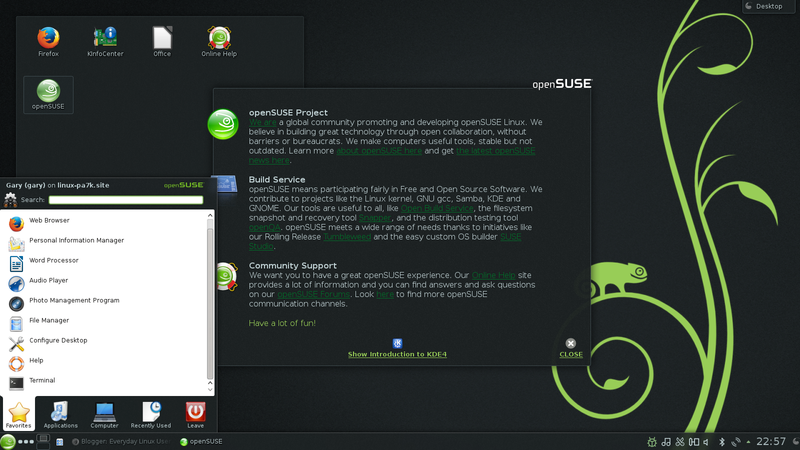 I’m not sure that openSUSE is for everyone. I think that if you haven’t tried Linux before then you might get frustrated by some of the hoops you have to jump through when you first get started. Once you get used to it though openSUSE is certainly stable and everything is there that you could possibly need. Overall it was a decent enough experience but I’m not sure I prefer it over Kubuntu. 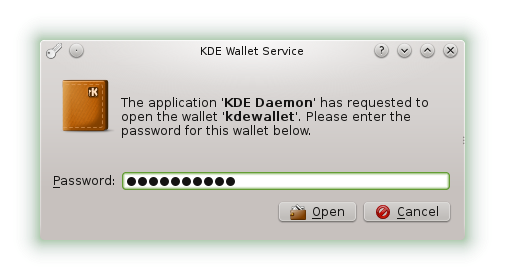 During the course of the next week I will be looking more closely at the KDE applications installed within openSUSE. I always have had real problems with open suse network configuaration. It works automatically in a live dvd environment but after install its just broken. Wouldn't even work after following their tutorials. This has always been a deal breaker for me with this OS and immediately dump it for another that works out of the box. If they have finally fixed this then fine I will look at it again. If not I can't waste my time trying to get it to work. But thanks for your well written article. All the best. "I always have had real problems with open suse network configuaration. It works automatically in a live dvd environment but after install its just broken", -same for me. I use Opensuse anyway. I think after installing the OpenSUSE 13.1 distribution, you should get networking established with YaST2 -> Network Devices -> Network Settings. (If you can't establish networking, nothing else matters, right?) Then you can update the installed packages with YaST2 -> Software -> Online Update followed by a reboot. Then, you can install codecs for audio and video at http://opensuse-community.org/index.html (for either KDE or Gnome). In the case of my nVidia 6150SE graphics card, I can't login to a KDE or Gnome session after the installation because the desktop is unusable with all of the horizontally colored streaks running through it. 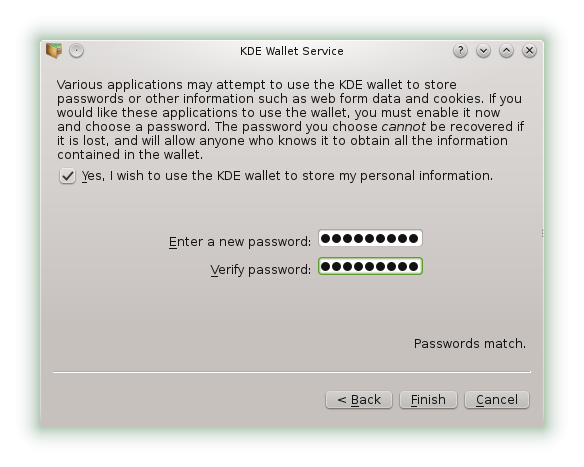 I have to log in to the IceWM (downloaded with either KDE or Gnome by default) to establish the network, upgrade the software, and install the proprietary nVidia graphics drivers from http://en.opensuse.org/SDB:NVIDIA_drivers#Easy_way_to_get_NVIDIA_drivers. 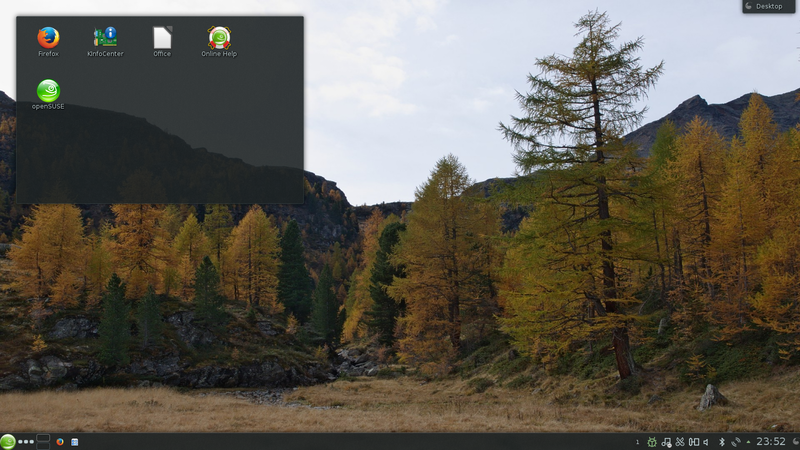 Once, I've got wireless networking, all of the software updates, and the nVidia graphics driver installed – All is great for me in the OpenSUSE distribution and I can login to either the KDE or Gnome session. I've always enjoyed reading your blog about Pc wallpapers and this particular post was especially good. Thanks for sharing it.